Bitcoin Technical Analysis & Bitcoin News Today: Can the EMA ribbon make a Bitcoin price prediction for 2022? It looks like we might already be in a Bitcoin bull run. I'll use technical analysis on the Bitcoin price to make a Bitcoin price prediction. Watch the video to learn more! Wow the EMA ribbon is just crazy accurate! Carl you rock! On top form as usual Carl. Thank you! Carl The Moon is one of the few I actually trust in crypto! I used your affiliate link to Tradingview and got the Pro upgrade, its very very good! Hey Carl…That monthly EMA ribbon is interesting. It looks like the next few months is very important for Bitcoin. Lets go to the mooooon!!!!! It is not very often that markets make a V-shaped recovery, another retest of the 200 week MA would be healthy maybe? You are amazing thanks for never giving up. It would be great if you do videos like that each Month! Monthly General TA? 🙂 What is different in this one, in comparison to other videos, is the fact that you did TA on all time frames rather than just focusing on the daily and 4h/1h. lmao this morning i was sharing a tweet of someone(swenLink) who said bitcoin will go to 3000k before going to 300 000k in this bull market, and he said that a year ago when the bear market started. BTC going from $0.06 to $100 was insane. Going from $5000 to $300,000 is just a continuation of that trend. Because the CCP has opened its money laundry machine. This is not market bro. Are you kidding me… This guy Carl said “we are going to 1m per bitcoin in a few years” when btc was at 10k, and according to him we reached the bottom.. and than at 7k we reached the bottom according to him, than followed by 5k. 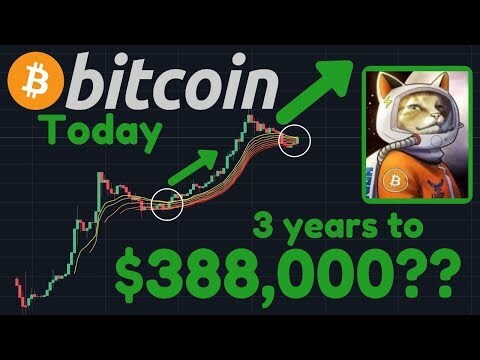 Eventually, Bitcoin hits 3k and he was silent… and now hes back with these ridiculous $388,000 prices for bitcoin. Always do your own research and take profits, don’t ever listen to these so called “crypto influencers”. Bitcoin ‘halving hype’ another day closer…..
You are correct. Although he also said that if you are not revising your predictions as the markets change then your previous predictions will not reflect current reality. Them: WHY DON”T YOU JUST USE A PAYPHONE? Us: Because we’re the future.